I'm wearing a few of my favourite pieces here including a couple of staples that I'll mention... Interested? Read on. 1) White t-shirt from Banana Republic (over which I later spilt the entire contents of my spaghetti bowl - needless to say I'll be popping into Banana Republic today) One of the most important pieces of a versatile wardrobe. A good White tee can be worn with everything from Victoria-Beckham-at-the-2006-World-Cup-short hotpants to a good shorts suit for work. This banana republic one is a dream. 2) Metallic embellished Marc Jacobs jacket. Now this I wouldn't say is everyone's idea of a wardrobe staple. But what I will say is that a good wardrobe needs Investment pieces Noun. An item or garment that lasts a lifetime and can be used to transform an outfit. 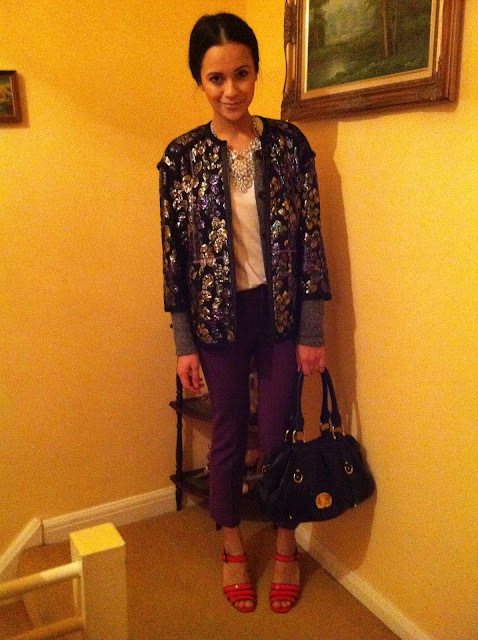 3) Zara purple trousers - which I got for about £10 in the sale - yes, bargain. (And which was also, and rather unfortunately involved in the spaghetti bowl incident.) A good pair of coloured trousers are a great item to have for work wear purposes - they can transform a get up from drab to dressy. 4) Prada sandals - I wouldn't call these an essential, but bright heels often come in handy. 5) Burberry handbag - also not an essential. 6) Mikey necklace - nope, don't think this is an essential either. But, if you know me, then you'll know that I do love a good statement necklace to add interest to simpler get ups. Funny thing is that this sounds like a work wear post when really, this is what I wear to dinner. But it is no coincidence that i was once asked if I'd come to a bar straight from work as I looked 'so smart'. I'd actually just been watching Kim and Kourtney Take New York at home. Yes, I do like trash tv. Don't judge me.